A garden with room for a view is one thing but a gobsmacking garden with many rooms, each with completely different views, is something altogether different and a little tough to capture with still photos rather than 3D Sensoround. But I’ll try. 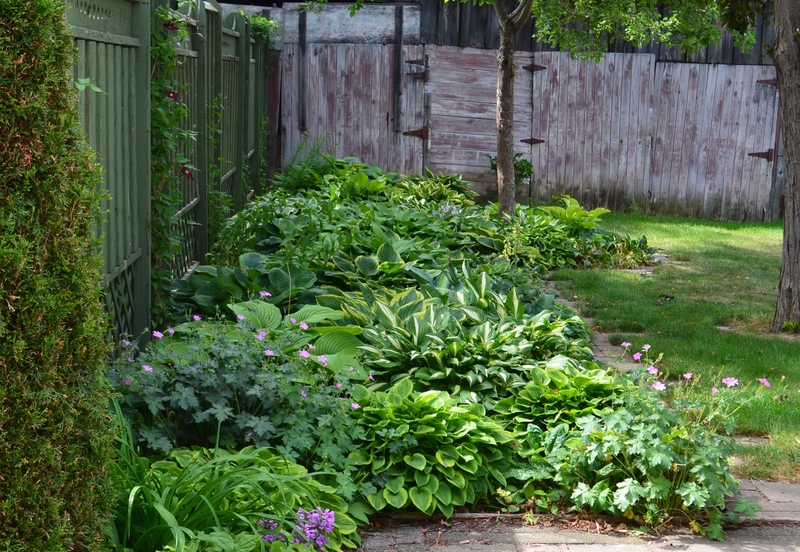 On a recent (June 23, 2016) garden tour presented by the Toronto Botanical Gardens, host Frank Kershaw (garden design pro and plantsman extraordinaire) brought us up to the entrance of this garden and let us loose. There was no need for a tour. The garden led us on its own. Using fences, archways, and a meandering path, the gardeners (one a fine art sculptor) had created not one garden but several garden rooms that flowed into each other but kept their mysteries to themselves right up until the moment you entered each. This is a view of one side of the front entrance. The green painted fence encloses the garden. Or rather gardens. What’s truly amazing is that what you’re about to see is all crammed into what amounts to the space of a largish suburban backyard. …this pond and patio, complete with two chairs positioned exactly where you’d want to plop and take it all in. But there’s more. …a sunken garden with a massive water feature of sculpted panels made by the artist. Opposite the steps down into the sunken garden was a shady pergola for outdoor dining. To the right of this cool retreat was a path that lead up to a narrow entrance through a tall, solid fence. What lay beyond was jaw-dropping. A mossy zen garden greeted you with rock-lined brooks, foot bridges, and decorative stones. Walking from the sunken garden to this, I felt like I’d just been transported from Provence to Kyoto. Almost the entire surface of this garden was upholstered in a soft mat of Irish moss which, as moss aficionados know, is not a moss at all. So this entire garden is sprigged all over in tiny white flowers in spring. The zen garden led you along a stone path to a latticed archway. Another mood shift. The artist had framed a collection of ceramic faces within the lattice. Were they laughing at me? No. They were laughing with me. The archway did a great job of lifting the mood from contemplative to lighthearted. 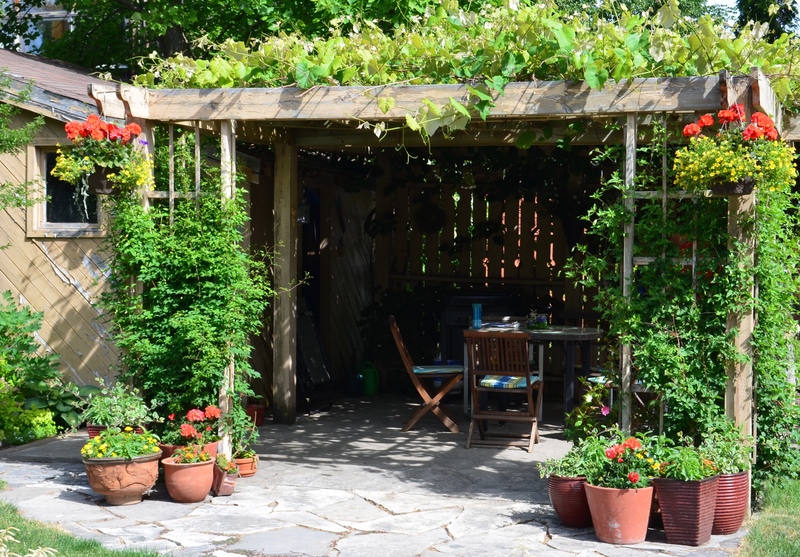 The last garden in the loop was a shady hideaway tucked up against the side of the house. Once again, there were signs of creativity in the garden ornaments and in the paving. On the far side of this garden, I found myself back out where I had first fell through the rabbit hole into this wonderland. It just goes to show that if you want to add a room (or two) with a view in your garden, your only limit is your imagination.